The Ready Reserve Force (RRF) was created within the National Defense Reserve Fleet in 1976 to support the rapid worldwide deployment of U.S. military forces by transporting unit equipment and follow-on supplies. The RRF consists of 68 vessels, four of them in full operational status overseas, two on loan to state maritime academies as training ships, and the others normally maintained in reserve in a condition in which they can quickly be crewed and activated. Some 40 of them have been employed in support of Operations Enduring Freedom (Afghanistan) and Iraqi Freedom since 2001. 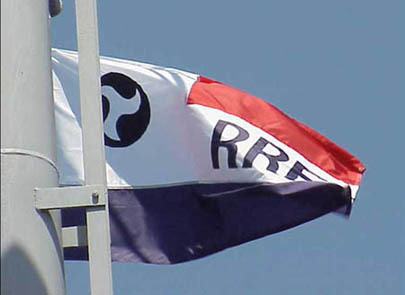 The flag of the RRF was introduced in connection with the force's 25th anniversary in 2001. It is a horizontal tricolor, red-white-blue, with a square white canton covering the first two stripes bearing the emblem of the Department of Transportation. The letters RRF in black sans-serif italics appear on the white stripe in the fly.